Editor's Note: This is the second of a two-part series by the author. To read part one, click here. Luminant Energy (a subsidiary of Vistra Energy, which also owns retail giant TXU) will retire three large coal plants—Big Brown, Monticello and Sandow—in early 2018, eliminating more than 4,400 MW of power from the grid, as well as millions of tons of carbon dioxide and millions of pounds of sulfur dioxide and nitrogen oxides. So what does this actually mean for Texas energy markets? What happens next? First came study and analysis. Any electric-producing entity that wants to mothball or retire a generation asset must publicly announce its intention to allow ERCOT and other market participants to assess how the retirements will impact market adequacy and reliability. Under present rules, participants must announce at least 90 days before, although recent action at the Public Utility Commission and ERCOT will require future retirements to be announced a minimum of 150 days in advance. ERCOT recently completed assessments of these retirements and could have done one of three things: allow the units to retire; order some or all of the plants to remain open through a non-market Reliability Must Run agreement for some time while transmission or other congestion issues are fixed or allow the units to retire but order a different non-market solution to local issues known as a Must-Run Alternative, which could include local battery storage, demand response or smaller generation units. Market participants breathed a sigh of relief when ERCOT announced last week that they would allow all three plants to retire. Basically, they found no reliability issues with retirement. While ERCOT will not release its annual “predictions” of summer demand and capacity until December 18, 2017, assuming all 4,400 MW do retire next year, ERCOT’s expected reserve capacity (the amount of extra generation above its peak use) would fall from about some 18 percent to about 11 percent. And if peak was to be larger than expected, there could be days when the system would need to declare an emergency event to allow loads to drop electricity use (through contracts with ERCOT). On the other hand, with average electricity prices so low during the past three plus years, the retirement of the coal plants could finally boost prices during high demand to allow generators to earn some healthy returns and provide a boost to new investment. In other words, lowering reserves capacity may be exactly what the market needs. Most analysts predict that energy prices will rise next year because of the tighter market. The fundamental premise that coal plants will continue to retire while more wind and solar systems will be built is no longer in question. Why are energy lobbyists interested in Project 47199? Project 47199 is a PUC-sponsored project that discusses potential major changes to ERCOT’s energy-only market. This proposal emerges from a white paper, “Priorities for the Evolution of an Energy-Only Electricity Market Design in ERCOT,” written by Harvard economist William Hogan and FTI Consulting’s Susan Pope. Two of ERCOT’s largest generation companies—NRG and Calpine—funded the project. While the recommendations are complex, essentially they involve adjustments to energy prices that will, as a general rule, favor natural gas plants that are located near load centers. At two PUC-held workshops, some of the Hogan-Pope recommendations received support, including “co-optimizing” energy and ancillary services— essentially operating reserves and other services that both generation and loads provide to keep the lights on—so they would both be settled and “chosen” in the real-time market. Most stakeholders also appear to support an adjustment in scarcity prices when ERCOT uses non-market mechanisms such as paying Reliability-Must-Run facilities or a similar command-and-control measure known as Reliability Unit Commitment (since they undermine price formation). The most controversial proposal would for the first time incorporate marginal line losses into energy prices. While ERCOT does have a separate market for congestion rights—to help mitigate any congestion for overloaded lines— currently the loss of energy as it travels along the hundreds of miles of transmission is not factored into pricing. In doing so, this policy would generally support generation sources that are located near areas along the Texas coast (e.g., natural gas plants along the coast). This same policy would lower earnings for other generators, especially wind and solar generators since they are typically located in West Texas, far removed from demand centers. A separate analysis conducted by the Brattle Group on behalf of the Wind Coalition and other generation resources found the transmission “marginal loss” recommendation would lower payments to generators by nearly $200 million in an average year, including more than $50 million for wind operators—but probably not lead to a significant increase in payments to local natural gas plants. Late last month, the PUC took their first steps. They separated the issues, putting transmission cost allocation and rate design, the assignment of interconnection costs, and the "loads in SCED" proposal as separate applications apart from the larger project. The larger project—still known as 47199—will focus on co-optimization, energy price adjustments, and transmission marginal losses, and will require more study and input from stakeholders. Whatever the potential changes, the fundamental premise that coal plants will continue to retire while more wind and solar will be built is no longer in question. In fact, ERCOT data through October showed nearly 50,000 MW of new generation projects under study, while another 21,000 MW of potential generation already had interconnection agreements. While many of these projects will likely never see the light of day, interestingly 56,000 of the 70,000 MW are wind or solar projects, with the rest natural gas or a smaller number of energy storage projects. ERCOT, Generator Interconnection Status Report, October 2017, Project MW by Fuel Source. 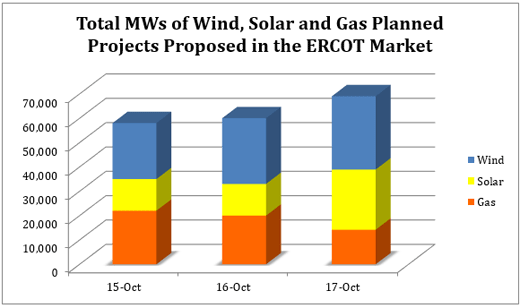 Note: Graphic includes all wind, solar and gas projects in all phases of interconnection studies. In the end, the beauty of ERCOT’s market is leading to cleaner air and more clean energy development, whatever the ultimate impacts of environmental or market regulations. How’s that for progress in this age of political uncertainty?